This page is the main page of the documentation for poezio, explaining how to use it and describing its interfaces. Poezio is composed of tabs which can be of various types. Each tab type has a distinct interface, list of commands and list of key shortcuts, in addition to the global commands and key shortcuts. On all tabs, you get a line showing the the list of all opened tabs. Each tab has a number, each time you open a new tab, it gets the next available number. On all tabs, you get a pane on the left side of the screen that shows a list of the opened tabs. As stated above, each tab has a number, and each time you open a new tab, it gets the next available number. This mode is enabled by setting the enable_vertical_tab_list option to true in the configuration file. The tab numbered 0 is always the roster tab, the other tabs can be of any type. Blue (tab 0): an inactive tab of any type, nothing new to see there. Purple (tab 1): a MultiUserChat tab with at least one new unread message. Green (tab 2): a tab of a private conversation (Private tab or Conversation tab) with a new message to read. Cyan (tab 3): the current tab. Red (tab 4): a MultiUserChat tab with at least one new highlight message. Alt+e, this will jump to the next tab with the highest priority. Priority applies in this order: private message > highlight message > normal message. This is a unique tab, always numbered 0. It contains the list of your contacts. You can add (/add, /accept), remove (/remove) and search contacts from there, and you can open a conversation with them (Enter key). Use the direction arrows (↑↓) to browse the list, the Space key to fold or unfold a group or a contact. Area where information messages are displayed. Actual list of contacts. The first level is group, the second is the contacts and the third is the resources of your online contacts. More informations about the selected contact. This tab contains a multi-user conversation. The conversation window, this is where all the messages and events related to the muc will be displayed. It can be scrolled up and down with PageUp and PageDown. Your information in that MUC (the name of the room, your nick, your role and affiliation). The topic of the room. 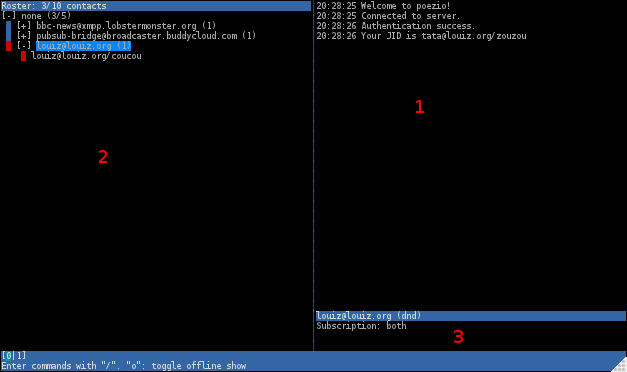 This is the tab opened with the /query command in a MultiUserChat tab, letting you talk in private with a participant of a multi-user chat. This is just a simple one to one conversation, with a line showing the status, name and chatstate of the participant. A tab opened from the roster or /message, to talk in private with one of your contacts. This is also just a simple one to one conversation, with a line showing the status, name and chatstate of the participant, as well as a line at the top showing the status message of the contact. Plugins may add some elements to the status line. This tab lets you view a form received from a remote entity, edit the values and send everything back. It is mostly used to configure MUCs with the /configure command but can actually be used for almost anything. Use the Up and Down keys to go from one field to the other, and edit the value using the Space, Left or Right keys, or by entering text. You can then send the completed form using Ctrl+y or cancel using Ctrl+g. 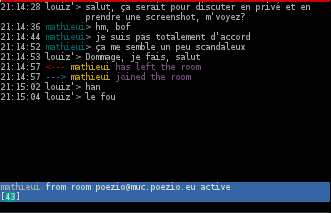 This tab lists all public rooms on a MUC service (with the /list command). It is currently very limited but will be improved in the future. There currently is no way to search a room. Use the Up and Down or PageUp and PageDown keys to browse the list, and use Enter or j to join the selected room. You can sort the rooms by moving the direction arrows (← or →) and pressing Space when you are on the appropriate column.